A new album from Robbie Williams is set to be released next year by Universal Music following a deal struck between the world’s leading record company and the most successful British male solo artist ever. 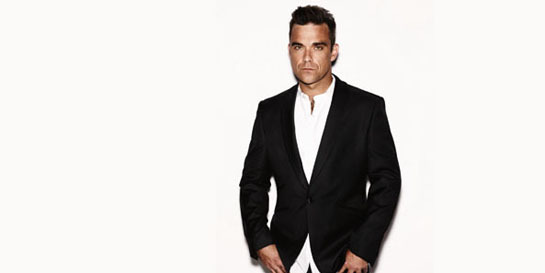 The new studio album – Robbie’s first since 2009 and his latest creative venture following his phenomenally successful reunion with Take That – is likely to be the most hotly-anticipated new release of 2012. It will be issued worldwide by Universal Music next Autumn. Robbie says: “I'm really thrilled to be joining the Universal family at what I think is the most exciting time in my career." Tim Clark, Director, ie:music ltd, says: “This great new deal puts Robbie Williams firmly in control of his own destiny, but with the most muscular of partners." Robbie is currently recording the new record, his ninth studio album, in his own studio in Los Angeles. Universal Music Group Chairman/CEO Lucian Grainge says: "What a thrill this announcement is. To be working with Robbie and his team, and to have the opportunity to support this incredible stage of his career, makes life so exciting." Robbie Williams has sold over 60 million albums over his solo career and has won more Brit Awards than any other artist in history. His number one anthology In And Out Of Consciousness - Greatest Hits 1990 - 2010 was the best selling greatest hits album of last year whilst his seven number one UK albums mean he is easily the biggest selling solo artist in UK history. Robbie's 2010 Brit Award for Outstanding Contribution To Music brought his tally of Brits to 16, more than any other artist since the awards began.